ARRL President Kay Craigie, N3KN, has told Section Mangers that, while promotion and positive publicity about the Amateur Radio Parity Act (H.R. 1301) are always helpful, the most useful action radio amateurs can take is to contact their members of Congress, urging them to sign on as cosponsors. As of June 9, 72 members of the US House in both parties were listed as cosponsors of the proposed legislation, which would direct the FCC to extend its rules relating to reasonable accommodation of Amateur Service communications to private land-use restrictions. Craigie told the SMs that the grassroots campaign supporting H.R. 1301 needs more letters. "We have been told quite bluntly by some congressional offices that they want letters from constituents -- that they will be interested in what the ARRL has to say only if they know that voters care about this issue," Craigie said in urging Section Managers to rally the troops. "Why should the congressman care, they ask, if the voters don't? There are tens of thousands of ARRL members who have not written yet. You can do a lot to persuade them to write, because they know you." Craigie cited the case of US Rep John Carney of Delaware, who signed on as an H.R. 1301 cosponsor this week. Delaware Section Manager Bill Duveneck, KB3KYH, told her that ARRL members have been appealing to the state's lone Member of Congress to support the bill. "Late last month, ARRL representatives visited Congressman Carney's Washington office and delivered a stack of approximately 50 constituent letters," Craigie recounted. "That, in addition to the in-state contacts, got the congressman's attention, and he agreed to cosponsor." Craigie pointed out that the 50 letters were all the more impressive in the case of tiny Delaware, where there are fewer than 500 ARRL members. "Do the math!" she said. "If we could get a similar percentage of ARRL members in additional districts to write their members of Congress, the bill's progress would accelerate. Local in-district contacts plus concentrated letter-writing efforts add up to co-sponsorship. Here's to Delaware and all the other districts whose ARRL members are getting the job done for H.R. 1301." Members are encouraged to contact their member of Congress by writing personalized, signed letters on paper, based on the sample letter, available on the ARRL H.R. 1301 web page. Letters should go to ARRL Headquarters for hand delivery to the appropriate House members. Send letters to ARRL, ATTN H.R. 1301 Grassroots Campaign, 225 Main St, Newington CT 06111. Sending these letters via ARRL allows Headquarters staff to keep track of how many communications are going to which congressional districts. But more important, Craigie pointed out, when letters are delivered to the Hill in person, there's an opportunity to speak with congressional staffers. "The stack of letters is proof that voters care about the bill," she said. "We have to convince the staff people, so they'll advise the Member of Congress to cosponsor. That's how it works on Capitol Hill." Craigie further urged Section Managers to mention the bill when they speak at conventions and club meetings. Craigie also encouraged members whose US House member already has signed on to H.R. 1301 as a cosponsor to call, write, or e-mail a message of appreciation. "Good manners, good strategy," she said. The League is working on having a US Senate version of H.R. 1301 introduced. The latest House members to sign on as H.R. 1301 cosponsors include Bill Flores (TX), Patrick McHenry (NC), Ann Kuster (NH), John Carney (DE), Marsha Blackburn (TN), and Matt Salmon (AZ). Appearing on "Ham Radio Now" (L-R), ARRL Public Relations Committee Chair Katie Allen, WY7YL; ARRL Media and Public Relations Manager Sean Kutzko, KX9X, and "Ham Radio Now" host Gary Pearce, KN4AQ. KN4AQ, to share some views and advice on the topic "What Field Day is REALLY About" and how to convey this to FD visitors and reporters. All three agreed on one big point: Stress that 95 percent of what radio amateurs do is fun. "Share your excitement," Allen advised. All also agreed that club members attempting to tell what's happening at their Field Day site need to avoid ham radio jargon. "Be less 'hammy' about it," Allen suggested. "Nobody's going to know what 40 meters is," Kutzko rejoined, while conceding that it can be hard for hams to avoid using terms such as "fist," "worked," and "QSO" when talking with anyone not familiar with Amateur Radio. Pearce recommended fine-tuning "an elevator pitch" to explain the hobby to non-hams. The program edition also critiques some specific ham radio publicity efforts and media encounters. The June 10 "Ham Radio Now" (HRN No 208) webcast is available on YouTube. A relatively obscure piece of Texas legislation with potential ham radio implications may serve as a model for other states considering similar laws. 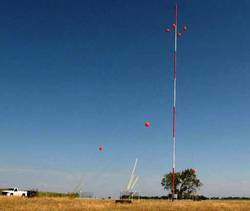 The beauty of the bill, SB 505, concerning "Painting and Marking Requirements for Certain Towers" -- colloquially called "the crop duster bill" -- is that it never mentions Amateur Radio. That did not happen by accident. Initial impetus for such legislation was a 2013 National Transportation Safety Board recommendation that states enact laws requiring that meteorological evaluation towers (METs) be marked and registered. The recommendation came in the wake of fatal crop dusting aircraft collisions with METs, often erected on short notice in agricultural areas. "The West Gulf Division legislative team did an excellent job of working with the sponsor of the bill to minimize its effect on Amateur Radio," West Gulf Division Director Dr David Woolweaver, K5RAV, said. He gave the credit to West Gulf Vice Director John Stratton, N5AUS. Woolweaver said that over the years, the Division's legislative experts have managed to stop or have modified several bills considered objectionable to ham radio. They also have worked to have language placed into statutes that prevents Amateur Radio gear from being conflated with "mobile communication devices." Paul Gilbert, KE5ZW, who works for the Texas Department of Transportation, was involved in developing a fiscal impact note on the legislation. "It was driven by national and state crop duster associations at the behest of their members to mark the meteorology or weather towers located mostly in wind turbine fields," Gilbert explained in summing up the issue. "The dusters seemed not to be able to see the towers. The duster folks had tried to work with the FAA, but since the towers are [lower than] 200 feet and not located normally near airports, the FCC declined to regulate further." States then were urged to pick up the ball. Gilbert said some state laws focused specifically on METs, others did not, and the initial language in the Texas bill was too broad. At Woolweaver's direction, Vice Director Stratton contacted the sponsors and pointed this out. According to Gilbert, the original language "swept up just about any tower or pole that was under 200 feet tall" and not used for cell telephone purposes or that did not fit into any of the exclusion definitions. But it did not exclude Personal Mobile Radio Service (PMRS) towers either. "This was significant, since most Amateur Radio repeater systems are located on Part 90 Public Safety or commercial towers," he said. Including these towers could impact Amateur Radio repeater sites by placing the cost of compliance on a tower's owner or by including an Amateur Radio tower under the statute's broad definition. 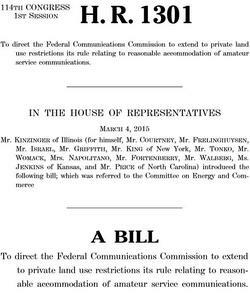 In the end, rather than specifically excluding Amateur Radio, the bill was reworded directly -- and by definition -- to include only METs, providing a de facto exclusion for ham, and public safety/commercial towers. By squarely addressing the issue at hand without apparent unintended consequences, the Texas bill could serve as an example for other states in developing their own MET legislation. Texas Governor Greg Abbott signed the bill into law in May. It amends § 21.071 of the Texas Transportation Code and becomes effective on September 1. A young ARRL member from New York has begun a "Collegiate Ham Radio Operators" Facebook group. Sam Rose, KC2LRC, who lives in the Syracuse area, said the group is aimed at "college ham radio club members everywhere" who would like to share and collaborate on college ham radio activities. The group is open to anyone interested in college ham radio clubs -- from members and alumni to faculty and even prospective college ham radio club members. Among the group's fans is ARRL President Kay Craigie, N3KN, who lives in the college community of Blacksburg, Virginia -- the home of Virginia Tech (K4KDJ). "I am encouraged to see college Amateur Radio organizations that are lively and interested in communicating with each other," Craigie said. "It builds the future of Amateur Radio and may help their career opportunity networking also." Rose was the 2008 recipient of the Dr James L. Lawson Memorial Scholarship, managed by the ARRL Foundation. 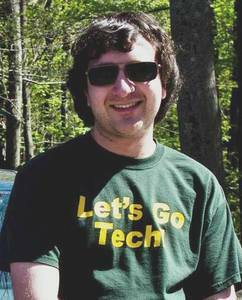 He is a graduate of Clarkson University and was active in Clarkson University's Amateur Radio Club (K2CC), including a 2-year stint as its president. Earlier this year, Rose organized the Collegiate Dinner during the week of Dayton Hamvention on behalf of the Clarkson University ARC (he has posted a YouTube video of the 2015 Dayton Hamvention experience), and he said the Dayton gathering inspired the Collegiate Ham Radio Operators group. "This group is something we decided to start at the Collegiate Dinner at Hamvention, where students, faculty, and alumni from Virginia Tech, Rose-Hulman Institute of Technology, Michigan State, Texas A&M, Kansas State, Clarkson, and a few other schools attended," Rose told ARRL. "We intend it as an online 'watering hole' of sorts, for clubs across the world to post the goings-on of collegiate ham radio, and, through this, exchange ideas for projects, activities, and recruitment of members." Read more. Keysight Technologies (formerly Agilent) has donated software that will augment the feature set of the ARRL Laboratory's MXA-9020A spectrum analyzer. The donation includes 89600 VSA vector signal analysis software. According to ARRL Lab Senior Test Engineer Bob Allison, WB1GCM, 89600 VSA gives the MXA-9020A the ability to measure the parameters of digital signals. Keysight also contributed its BenchVue software, which can control the instrument and capture data and images without requiring programming. "With the help of Keysight and ARRL Laboratory technical advisors, the ARRL Laboratory will be able to develop test methods to better quantify the performance of digital Amateur Radio transceivers," Allison said. 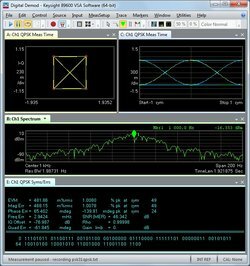 Keysight 89600 VSA screen shot on the Lab's Keysight MXA-9020A spectrum analyzer, displaying the parameters of a QPSK signal. Under the direction of Keysight Vice President Bob Witte, K0NR, application engineers Ken Voelker, K0KV, and Tom Holmes, N8ZM, delivered the 89600 VSA software to ARRL Laboratory Manager, Ed Hare, W1RFI, and Allison at the close of the 2015 Dayton Hamvention®. The donated software includes provisions to assess additional modes of operation, including the ability to analyze I/Q signals and to measure noise figure, pulse signals, and phase noise. "Each new mode was demonstrated by Ken and Tom during a 2-day training session, using the Lab's MXA-9020A," Allison said. In addition, Brian Wood, W0DZ, showed how the free BenchVue software, which facilitates the simultaneous display of multiple measurements, can eliminate the need for custom programming. "BenchVue is Windows-based and easy to learn," said Allison. "The software will enable the ARRL Laboratory to perform measurements and capture data and images without having to manually set up the analyzer for each measurement." Allison expressed gratitude to Voelker, Holmes, and Wood "for the excellent training on behalf of Keysight Technologies." Visit the Keysight website for more information on the MXA-9020A, 89600 VSA software and BenchVue. "The Lab is grateful to Keysight for this significant donation, which provides us with previously unavailable capabilities to analyze the characteristics of digital signals, said Hare. The ARRL has just released a digital edition of The ARRL Extra Class License Manual in Kindle format, in addition to the print manual. The Kindle edition from Amazon completes the suite of ARRL license manuals available in e-book format. As the leading publisher of Amateur Radio licensing and training materials, ARRL is expanding beyond traditional printed books to meet the increasing demand from readers who prefer digital publications. The ARRL also offers Kindle editions of The ARRL Ham Radio License Manual, The ARRL General Class License Manual and its question-and-answer study guides, ARRL's Tech Q&A, ARRL's General Q&A, and ARRL's Extra Q&A. 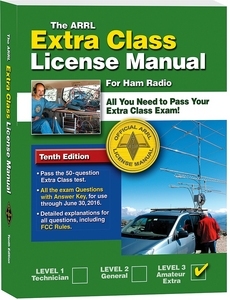 The ARRL Extra Class License Manual is also available in softcover (ARRL Item No 5170, retail $29.95) from the ARRL Store or from your ARRL Publication Dealer, or call 860-594-0355 (toll free in the US, 888-277-5289) to order. Kids Day is Sunday, June 21! (Don't be fooled -- the incorrect date appears in the "ARRL Amateur Radio Calendar.") 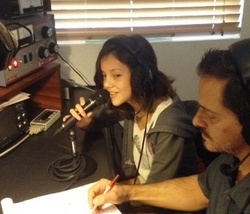 Sponsored by the ARRL and The Boring (Oregon) Amateur Radio Club, Kids Day is a fantastic way to introduce young people to the magic of Amateur Radio by getting them on the air! This time, Kids Day just happens to share the same date as Father's Day. Participating with your child or grandchild would be a fabulous way to celebrate the special bond between generations. But no matter if you're a mom, dad, grandparent, aunt, uncle, family friend, or neighbor, Kids Day is a great opportunity to open the doors of your station and let the youngsters take the "Big Chair." Let them find stations they hear or work on a map, color in a map of states worked, or help them to build something. Epiphany Ellis with coach Carl, KH7BB, during the January 2014 Kids Day at KH6LC. Kids Day takes place in January and June of each year, offering an opportunity for veteran hams to promote Amateur Radio to our youth. "For youngsters, their positive ham radio experience may foster an interest in getting licensed one day; they represent the future of Amateur Radio," said ARRL Contest Branch Manager Matt Wilhelm, W1MSW. "For veteran radio amateurs, this is an ideal chance to share your station and affection for Amateur Radio with the next generation." To attract attention, call "CQ Kids Day." The suggested exchange is name, age, location, and favorite color. There is no limit on operating time, and stations may work each other more than once if the operator has changed. Repeater contacts (with permission of the repeater's sponsor) are okay too, and satellite contacts may provide a real thrill. Note that while the June 2015 Kids Day is on a Sunday, the event will return to Saturday in June 2016. Date: Sunday, June 21, 1800-2359 UTC. Operate as much or as little as you like. Suggested exchange: Call "CQ Kids Day." Exchange name, age, location, and favorite color. It's okay to work the same station again, if an operator has changed. Suggested frequencies: 28.350 to 28.400 MHz; 24.960 to 24.980 MHz; 21.360 to 21.400 MHz; 18.140 to 18.145 MHz; 14.270 to 14.300 MHz; 7.270 to 7.290 MHz, and 3.740 to 3.940 MHz, as well 2 meter repeaters (with the permission of the repeater's sponsor). Control operators: Observe third-party rules when making contacts with stations outside the US. "From everything I can determine, these satellites meet all of the requirements for OSCAR designations," Tynan told Bruninga. "Therefore, by the authority vested in me by the AMSAT-NA President, I hereby confer the designation Naval Academy OSCAR 83 on BRICsat and Naval Academy OSCAR 84 on PSAT. I, and the entire amateur satellite community, hope for successful missions for both NO-83 and NO-84 and congratulate you and the rest of the Naval Academy team who designed, built and tested these two OSCAR spacecraft." The two satellites were among several that were launched on May 20 from Cape Canaveral. PSAT's digipeating capabilities are essentially the same as PCSat (NO-44) and the Amateur Radio packet system on the International Space Station. PSAT is on 145.825 MHz (1200 baud APRS), and BRICsat is on 437.975 (1200/9600 baud AX.25). BRICsat-P (NO-83) -- the Ballistic Reinforced Communication Satellite -- is a low-cost 1.5 U CubeSat built in the US Naval Academy Satellite Lab in collaboration with George Washington University. It was designed to demonstrate on-orbit operation of a micro-cathode arc thruster (µCAT) electric propulsion system and carries an Amateur communication payload. PSAT and BRICsat also carry 300 mW Brno University PSK31 transponders -- 28.120 MHz up/435.350 MHz (FM) down. The PSK31 transponder, PSAT's primary mission, permits dozens of simultaneous users to operate full duplex and maintain a continuous group dialogue throughout a pass. Gordon Marshall, W6RR (ex-W6ITA), of Pasadena, California, died on June 2. He was 95. An entrepreneur and a top contester of a bygone era, Marshall was an ARRL Life Member. He also was a trustee and generous patron of the University of Southern California, from which he graduated in 1946 with a degree in accounting. Marshall grew up in South Pasadena, got his ham ticket in the 1930s, and, during World War II, was a B-24 bomber pilot. In 2004 at USC, Marshall spoke about how his involvement in Amateur Radio led to his successful career in the electronics business. His Marshall Electronics, founded in 1953, went on to become one of the top five distributors of electronics components in the US. According to the Los Angeles Times, Marshall was one of the longest-serving trustees in USC's history. 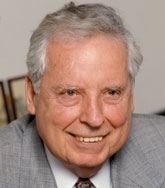 He joined the board in 1968, and served as its chairman and secretary as well as in other capacities. In 1996, Marshall donated $35 million to USC's business school, which was renamed The Gordon S. Marshall School of Business. He also served as a lecturer at the school, and in 2005 the USC Alumni Association presented him with its highest honor, the Asa V. Call Alumni Achievement Award. Marshall was inducted into the CQ Contesting Hall of Fame in 1996, and his Washington neighbor, Rush Drake, W7RM (SK), accepted the award on his behalf. Marshall was Drake's neighbor during the summer in the Seattle area, and, when Drake dismantled his W7RM superstation in the 1970s and moved south, Marshall acquired the adjoining Foul Weather Bluff tract. "I spent many hours at his place on Foul Weather Bluff, Washington, working on the clearing of land and construction of 200-foot AB-105 towers overlooking Puget Sound," said Chip Margelli, K7JA, who knew both Drake and Marshall. "Gordon had a great view to the north, and the Europeans on 20 meters brought many a smile to his face over the years." Marshall was a charter member of the Southern California DX Club. Read more. W9DXCC DX Convention and Banquet Set for September: The 63rd annual W9DXCC DX Convention and Banquet will take place September 11-12 in Schaumburg, Illinois. That's a week earlier than usual, because of hotel availability. Sponsored by the Northern Illinois DX Association (NIDXA), the event is an ARRL-approved operating specialty convention. One new addition this year is a Contest University (CTU) program that will join the DX University (DXU) on Friday. Saturday will feature a full program of speakers, exhibits, QSL card checking, a CW pileup contest, and door prizes. Retired FCC Special Counsel for Enforcement Riley Hollingsworth, K4ZDH, will be the banquet keynote speaker. Visit the W9DXCC website to register. Early registration ends August 1, and banquet orders are due by September 4. For more information, contact John McCormick, N0FCD. Free Morse Mouse App an Educational Tool for Newcomers: Chelmsford, England, radio amateur Charlie, M0PZT, has released Morse Mouse, an free app he developed to demonstrate Morse code to young people in the form of a game. He said the program, which runs in Windows, is aimed at aiding in the teaching of Morse code to youngsters -- and the young at heart. In the game, the player has 5 to 10 seconds to type the letter being sent in Morse. The program offers three "lives" to guess correctly, and the letter is sent again if the player is incorrect. with a repeat sending of the character if guessed incorrectly. The object is to get the mouse closer to the cheese, which happens with each correct response. If the player is wrong, the mouse moves away from the cheese. The quicker the player is at correctly identifying what has been send, the higher the final score. While he makes a crib sheet available, "that's not to say that those comfortable with 15-20 WPM speeds won't get some fun out of this," he said. Morse Mouse debuted in March as part of British Science Week. It certainly unleashed visitors' competitive streaks, with people trying to better their scores," he said, adding that some visitors expressed surprise that Morse code is still used. Veteran National Hurricane Center Amateur Radio Volunteer Joe Schmidt, W4NKJ: Joe Schmidt, W4NKJ, died March 24, following an injury and complications during surgery. In the 1980s Schmidt was one of the first Amateur Radio volunteers at W4EHW, which later became WX4NHC. "His dedication to our mission at NHC as well as volunteerism with the March of Dimes are examples of a true gentleman and a humanitarian," said NHC Assistant Amateur Radio Coordinator Julio Ripoll, WD4R. "He was also an incredible salesman, convincing over 30 manufacturers to donate radio equipment and antennas to WX4NHC, much of which is still in use today." Schmidt served as volunteer coordinator at the NHC. Tad Cook, K7RA, Seattle, reports: Solar activity strengthened during the past week. Average daily sunspot numbers increased from 34.3 to 112.4, and average daily solar flux rose from 97.8 to 131.4. We can only guess at the middle latitude A index for June 10-11, due to some sort of outage that deprives us of K index data over a 27-hour period. The outage began sometime after 1200 UTC on June 9 and ended sometime before 1800 UTC on June 10. June 8 was the day with the greatest geomagnetic upset, when the planetary A index rose to 33. Predicted planetary A index for the near term is 8, 20, and 14 on June 11-13, then 15, 10, and 8 on June 14-16, then 5 on June 17 through July 3. We'll then see another active period for July 4-9, when the predicted A index is 8, 20, 28, 20, 10, and 8. At 0202 UTC on June 10 the Australian Space Forecast Centre predicted increased geomagnetic activity on June 12, due to a coronal mass ejection. The Centre issued a second warning at 0336 UTC, predicting a glancing blow at Earth early in the UTC day on June 12. Predicted solar flux for the near term is 135 on June 11-13, then 130, 125, 120, and 115 on June 14-17, 120 on June 18-26, 115 on June 27, and 120 for June 28-29. The forecast then shows solar flux rising to 145 for July 5-7. In Friday's bulletin look for reports from readers, and an updated forecast. Send me your reports and observations.